StarPick Review: How it Works? StarPick is a UK based fantasy sports platform Co-founded by Ulf Ekberg, Trigam Mukherjee and Rohit Nair with their advisors and former cricketers Jonty Rhodes and V V S Laxman. It was launched in India on March 27, 2018. Currently, StarPick only supports cricket and football but later on, it will support sports like kabaddi, football, hockey, basketball, formula 1 and other sports. Since StarPick has just been introduced in India it offers free league in every match with Rs.20,000-100,000 in the prize pool. Before we talk about how StarPick works, you should create your account. You can either sign up or log in with Google or Facebook. After signing in you'll be taken to the Tournaments page. Here, you can select the tournament/league that you want to participate in. As you might have noticed in the above screenshot that this tournament has GW31 sign. So, what does it mean? GW stands for Gameweek. In each game week, 4 matches are played. GW3 means 3rd Gameweek. 1 stands for one match. This means that only one match is involved in this tournament. If it was GW33, it would mean that this tournament involves 3 matches from the 3rd gameweek. You will need to create your team by selecting players from all the teams that are playing those 3 matches. The result will be announced after all the matches are concluded. You can't select the VC(vice-captain) for this tournament. After you have clicked the Enter button you'll be taken to the Create team page. Your budget is 100M. Everything else is the same as Dream11. The price of the players is based on performance. You can select up to 3 All Rounders, 1 Wicket Keeper, 5 Bowlers, and 5 Batsmen. And you need to select at least 1 WK, 3 Bowlers, 3 Batsmen and 1 All Rounder. After you have created your team select captain(you will earn 2x points of the captain). You'll get your prize money according to the rank of your team. 1) In order to participate in the Matchup, a user needs to select a minimum of 4 duels and up to a maximum of 10 duels. 2) Once the user enters the buy-in amount, the payout ladder will be displayed and the payouts are fixed. User can choose a buy-in amount ranging from Rs.5 to Rs.1000. 3) Scoring: The points accumulated in the duel will be based on the player’s performance in the real game. The player with the higher score at the end of the game wins the duel. 4) In order to win the Fantasy Matchup, all the duels selected by the user should be correct. For example: If the user selects 10 duels in a Matchup, then, in order to win the Matchup, the user needs to win all the 10 duels. PLEASE NOTE THAT EVEN IF ONE OF THE DUELS SELECTED IS INCORRECT, THE MATCHUP IS LOST AND DOESN’T QUALIFY FOR THE PAYOUT. 5) Once the real game is completed, the winnings will be paid out to the users who have got all the duels correct. If one or both the players in a duel did not play the game, then the duel will be cancelled and the payout will be based on played duels in the Matchup. For example: If the number of duels selected is 4 and even if one of the duels is cancelled due to player not being part of the real Match, then the number of duels in the Matchup will be reduced to 3 and the payout will be based on 3 duels. Once the game is completed, it will take 24-48 hours for the winnings to be credited to the user wallet. You can redeem your winnings to your bank account. You need a minimum of Rs.500 to initiate the withdrawal. To withdraw your cash you need to verify your address and PAN card. 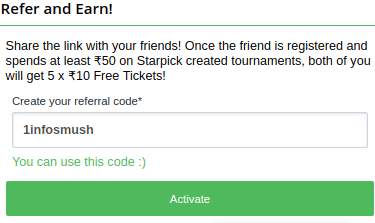 Once your friend is registered and spends at least ₹50 on Starpick created tournaments, both of you will get 5 x ₹10 Free Tickets! StarPick is available for all platforms. You can either access it through a browser or download the Starpick app.